P. Aji, a senior Shiv Sena leader, said their 'suicide squads' comprising men and women above 50 are ready for the supreme sacrifice. THIRUVANANTHAPURAM: The Kerala unit of Shiv Sena on Saturday threatened to stage mass suicides if women in 10-50 age group are allowed to enter the Sabarimala temple in Kerala. P. Aji, a senior Shiv Sena leader, told IANS here that their "suicide squads" comprising men and women above 50 are ready for the supreme sacrifice. "Our members will be stationed at various places in and around the (Sabarimala) temple and if any woman not supposed to enter the temple is granted get access, then their suicide squad members will take their lives," warned Aji. The Shiv Sena's threat comes hours after gender equality activist Trupti Desai on Saturday said that she is determined to visit the temple shortly. "We want the temple tradition and culture to be protected and that's our only demand. Hundreds of our activists will reach the temple town on October 17 and guard all entry points to the famed temple," added Aji. 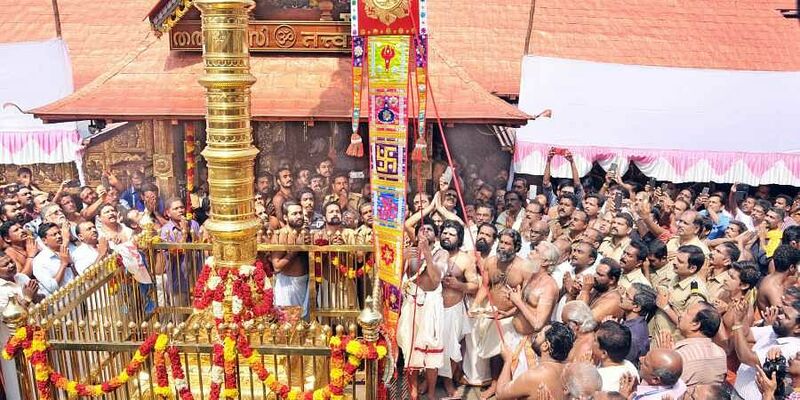 Given the aggressive posturing of the Shiv Sena members, now all eyes will be on the way the Kerala government led by Chief Minister Pinarayi Vijayan -- who has announced that the state government will ensure adherence to the apex court verdict -- handles the situation when the temple doors open on October 18 for its routine monthly pujas. In a related development, the police in Kollam district on Saturday registered a case against actor Kollam Thulasi for his statement at a public meeting of the Bharatiya Janata Party (BJP)-led NDA campaign against the apex court ruling. He said: "Women coming to Sabarimala temple should be ripped in half," and one half should be thrown to Delhi and the other half to the Office of Chief Minister Vijayan. But sensing that his statement had crossed limits of decency, he quickly apologised that he never meant to hurt anyone.